TS KGBV PGCRTs Post Graduate Contract Resident Teachers 580 CRTs 359 SOs 49 PET 62 Vacancies Recruitment Eligibility Apply Online Selection Procedure. Telangana KGBV PGCRTs Post Graduate Contract Resident Teachers 588 Vacancies in Telangana Kasturbha Gandhi Balika Vidyalaya TS KGBV as 84 Schools have been upgraded as Junior Colleges recently. KGBV PGCRTs Post Graduate Contract Resident Teachers 580 CRTs 359 SOs 49 PET 62 Vacancies Recruitment Eligibility Apply Online Selection Procedure Admissions are going on in Selected KGBV Schools for the Class XI. Post wise Educational Qualifications for PGCRTs in KGBV Schools of Telangana for the Groups MPC BiPC CEC MPHW PGCRTs Posts Staff Pattern in each College Telugu English Mathematics Physics Chemistry Botony Zoology, Civics Economics Commerce Eligibility Criteria Educational Qualifications Selection Procedure Online Application. Telangana Govt decided to start Class XI in selected 84 KGBV Schools for the Academic year 2018-19. Accordingly Admissions are going on. Education Minister Sri Kadium Srihari ordered officials to take up Recruitment process for Post Graduate Contract Resident Teachers PGCRTs in all selected KGBV Schools. Commissionor and Directorate of School Education issued order to District Educational officers to Start the Process of Recruitment as per the Guidelines. i) A Post Graduate Degree in the subject concerned (or its equivalent) (Annexure - A) with at least 50% marks in aggregate from a University recognized by the UGC. 1 PGCRT A. Academic Qualifications: i) Two year integrated Post Graduate Course from Regional Institute of Education of NCERT in the concerned subject; or Master's Degree from UGC recognized University in the following subjects. 6 PGCRT in Physics M.Sc. in Physics/ Applied Physics/ Electronics/ Applied Electronics of Osmania University / Nuclear Physics of Andhra University/ Meteorology and Oceanography / Engineering Physics and Instrumentation of Osmania University / M.Sc. (Tech) Co-Physics Note: Provided these candidates should have studied the subject Physics at B.Sc. level. 8 PGCRT in Botany M.Sc. in Bio Science of Andhra University/Bioloical Sciences of Osmania University/Plant Science of Krishnadevaraya and Osmania University/ Environmental Biology of Nagarjuna University/ Modern Biology of Maratwada University/ Experimental Biology of Saurashtra University/Bio Technology/ Life Sciences of Indore University/ Marine Biology of Andhra University/ Botany/ Micro-Biology Note: Provided these candidates should have studied Botany subject at their graduation level. M.Sc. Life Sciences of Berhampur University provided that the candidates opted for plant sciences in 2nd year/ M.Sc. Plant Science of University of Hyderabad. a) Special Officer · Post Graduate Degree and B.Ed. · Qualified in TET Exam-Paper II · Pass in Paper II of Telangana State Eligibility Test (TSTET) / Andhra Pradesh Teacher Eligibility Test (APTET) / Central Teacher Eligibility Test (CTET) with Mathematics and Science (or) Social studies as Optional. b) CRT Maths Must possess a Graduate / Post Graduate Degree in Mathematics (or its allied subjects as given in the Annexure V) from a University recognised by UGC with 50% marks in either Graduation or Post Graduation (In case of SC / ST / BC / Differently abled candidates, the minimum marks shall be 45%) and Pass in Bachelor of Education (B.Ed.) course with Mathematics as a Methodology subject from any institution recognised by NCTE. OR Must possess a 4-year B.A.B.Ed. / B.Sc.B.Ed. Integrated degree, with at least 50% marks (In case of SC / ST / BC / Differently abled candidates, the minimum marks shall be 45%) with the Mathematics as a Methodology from any institution recognised by NCTE. AND Pass in Paper II of Telangana State Eligibility Test (TSTET) / Andhra Pradesh Teacher Eligibility Test (APTET) / Central Teacher Eligibility Test (CTET) with Mathematics and Science as Optional. Physical Science / Physics / Chemistry /Science as a Methodology subject from any institution recognised by NCTE. (Candidates who study one of the two optional at Graduation and the other at Post Graduation with the required percentage are also eligible for the post) OR Must possess a 4-year B.A.B.Ed. / B.Sc.B.Ed. Integrated degree with at least 50% marks (In case of SC / ST / BC / Differently abled candidates, the minimum marks shall be 45%) with the Physical Science / Physics /Chemistry / Science as a Methodology from any institution recognized by NCTE. AND Pass in Paper II of Telangana State Eligibility Test (TSTET) / Andhra Pradesh Teacher Eligibility Test (APTET) / Central Teacher Eligibility Test (CTET) with Mathematics and Science as Optional. d) CRT Biological Science Must possess a Graduate’s Degree with any two of the following subjects as optional i.e. Botany (or its allied subjects as given in the Annexure V) and Zoology (or its allied subjects as given in the Annexure V) from a University recognized by UGC with 50% marks in either Graduation or Post Graduation (In case of SC / ST / BC / Differently abled candidates, the minimum marks shall be 45%) and Pass in Bachelor of Education (B.Ed.) course with Biological Science / Natural Sciences / Science / Botany / Zoology as a Methodology subject from any institution recognised by NCTE. (Candidates who study one of the two optional at Graduation and the other at Post Graduation with the required percentage are also eligible for the post) OR Must possess a 4-year B.A.B.Ed. / B.Sc.B.Ed. Integrated degree with at least 50% marks (In case of SC / ST / BC / Differently abled candidates, the minimum marks shall be 45%) with the Biological Science / Natural Sciences/ Science / Botany / Zoology as a Methodology from any institution recognised by NCTE. AND Pass in Paper II of Telangana State Eligibility Test (TSTET) / Andhra Pradesh Teacher Eligibility Test (APTET) / Central Teacher Eligibility Test (CTET) with Mathematics and Science as Optional. Test (TSTET) / Andhra Pradesh Teacher Eligibility Test (APTET) / Central Teacher Eligibility Test (CTET) with Social Studies as Optional. f) CRT Telugu Must possess Graduation with Telugu as one of the Optional / Graduation in Literature in Telugu / Bachelor’s Degree in Oriental Language (BOL) in Telugu / Post Graduation Degree in Telugu from a University recognised by UGC with 50% (In case of SC / ST / BC / Differently abled candidates, the minimum marks shall be 45%) and Pass in Bachelor of Education (B.Ed.) course with Telugu as a Methodology subject or Language Pandit Training in Telugu from any institution recognised by NCTE. OR Must possess 4-year B.A.B.Ed. / B.Sc.B.Ed. Integrated degree with at least 50% marks (In case of SC / ST / BC / Differently abled candidates, the minimum marks shall be 45%) with Telugu as a Methodology from any institution recognised by NCTE. AND Pass in Paper II of Telangana State Eligibility Test (TSTET) / Andhra Pradesh Teacher Eligibility Test (APTET) / Central Teacher Eligibility Test (CTET) with i. Mathematics and Science or ii. Social Studies as Optional. case of SC / ST / BC / Differently abled candidates, the minimum marks shall be 45%) with Hindi as a Methodology from any institution recognised by NCTE. AND Pass in Paper II of Telangana State Eligibility Test (TSTET) / Andhra Pradesh Teacher Eligibility Test (APTET) / Central Teacher Eligibility Test (CTET) with i. Mathematics and Science or ii. Social Studies as Optional. h) CRT English Must possess Graduation with English as one of the Optional / Graduation in Literature in English / Post Graduation Degree in English from a University recognized by UGC with 50% (In case of SC / ST / BC / Differently abled candidates, the minimum marks shall be 45%) and Pass in Bachelor of Education (B.Ed.) course with English as a Methodology subject from any institution recognised by NCTE. OR Must possess 4-year B.A.B.Ed. / B.Sc.B.Ed. Integrated degree with at least 50% marks (In case of SC / ST / BC / Differently Abled candidates, the minimum marks shall be 45%) with English as a Methodology from any institution recognised by NCTE. AND Pass in Paper II of Telangana State Eligibility Test (TSTET) / Andhra Pradesh Teacher Eligibility Test (APTET) / Central Teacher Eligibility Test (CTET) with i. Mathematics and Science or ii. Social Studies as Optional. i) PET Must possess Intermediate (or its equivalent) recognized by the Board of Intermediate Education, Telangana with minimum 50% marks. (In case of SC / ST / BC / Differently Abled candidates, the minimum marks shall be 45%) And A Certificate / Under Graduate Diploma in Physical Education / Diploma in Physical Education from an institution recognized by the NCTE. 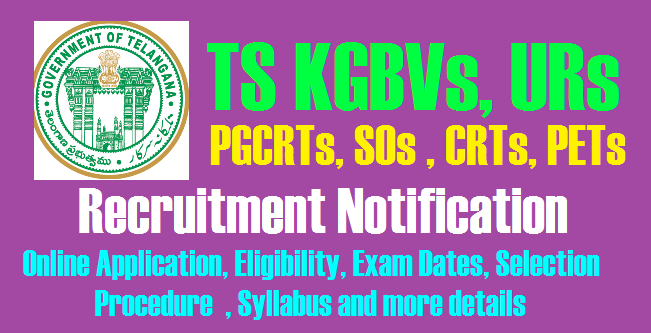 Candidates can get details of Telangana KGBVs, URs PGCRTs, SOs, CRTs, PETsRecruitment Notification, Online Application, Eligibility, Exam Dates, Selection Procedure , Syllabus and more details @ssa.telangana.gov.in Notification Important Dates written Exam Dates Vacancies Eligibility Educational Qualifications Application form Staff Pattern List of Schools Post wise Qualifications from this page.